In these journal pages I will be sharing some of my craft ideas and inspiration, with free templates for you to use in your own projects. I am slowly working on a quilt based on my 100 favourite novels, with each novel featuring as a 4 in x 6 in block. To check on my progress, click here for the Book Quilt page. My first two Shropshire murder mystery novels featuring garden designer Fern Green, Death in the Physic Garden and Death in the Winter Garden, are on sale as Kindle ebooks from Amazon, or in paperback direct from me at Beanpole Books. 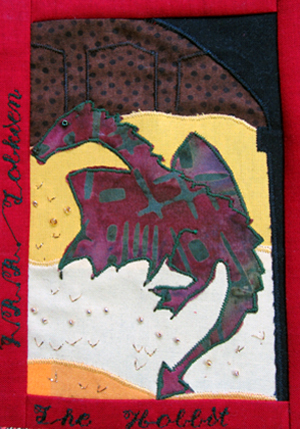 My Quilt Detective series introduces quilt artist Bronwen Jones. The first two books in the series, A Patchwork of Poison and Motif for Murder, are on sale as ebooks for Kindle and as paperbacks from Amazon. The stories combine patchwork and quilting with murder mystery and include templates for crafts and applique. I am working on the third book in the series. At last I have finished Module 8 of my City & Guilds course, and completed the textile box, above and below, which I had hoped to have ready for Christmas. Where did the time go? I also managed to make the little Tomte applique as a bottle bag, left. The hessian was a challenge to sew, though. I will make a start on Module 9 in February. It is promising to be an interesting one, making buttons and fancy cords and tassels. 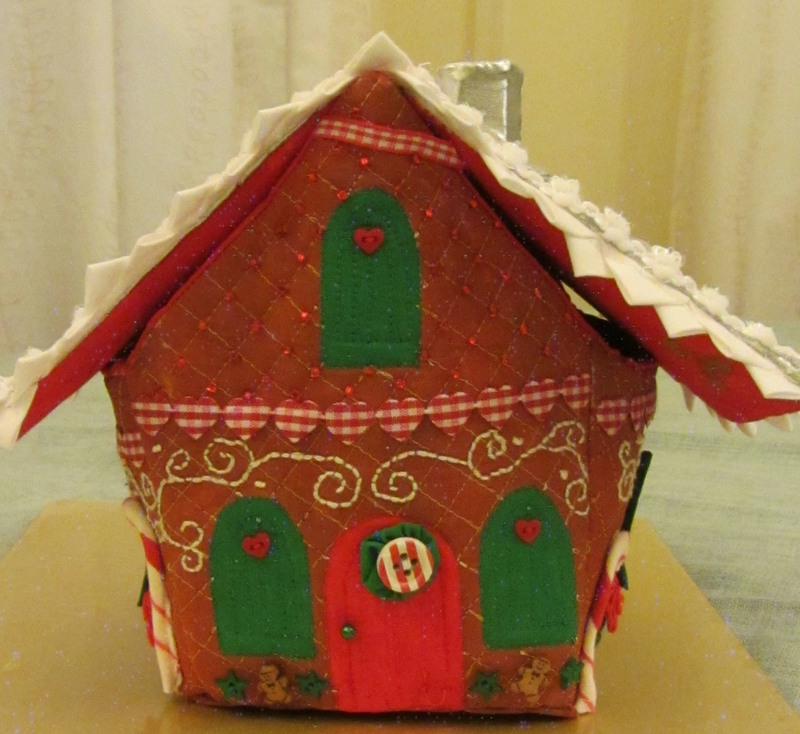 I also have to make a bag, which hopefully will not take as long as the gingerbread house did. For this I have drawn a design based on the Princess and the Pea fairytale. Wishing you a healthy and craft-filled 2019. I have just completed Module 8 of my City & Guilds course, and the two pictures are my version of a sample for a Baltimore album quilt. I wanted to finish the module by Christmas so decided a Christmassy theme would be perfect. 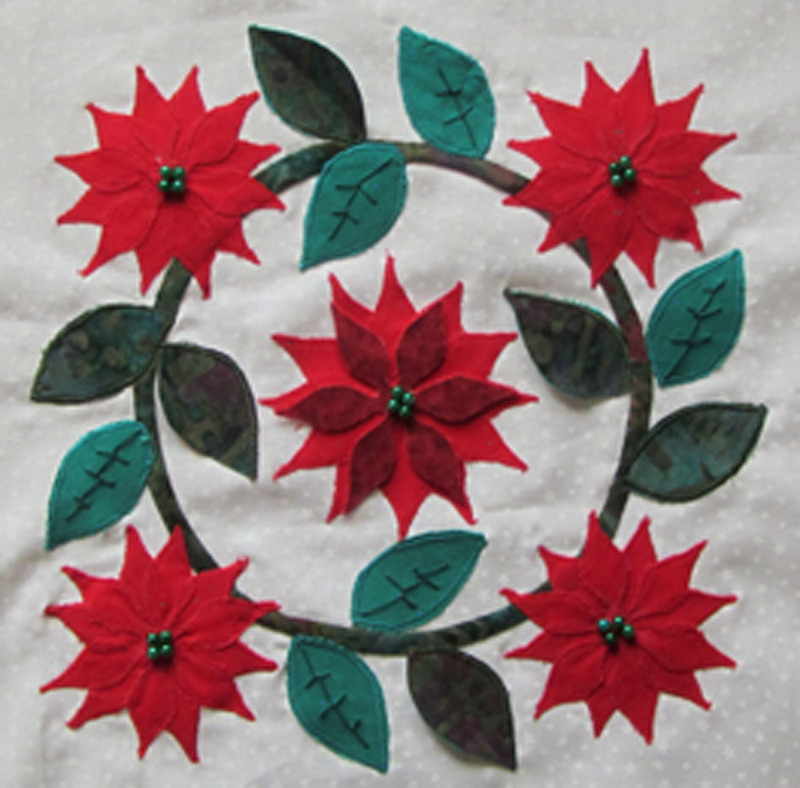 The poinsettia wreath was machine stitched applique with the pieces bondawebbed in place. For the Partridge in a Pear Tree I tried needle-turn and padded the bird, the pears, the branches and the pot, to give a more 3D effect, though my needle-turn technique needs some polishing! The pieces are 12 inch square so will make up into a cover for a Christmas scrapbook. 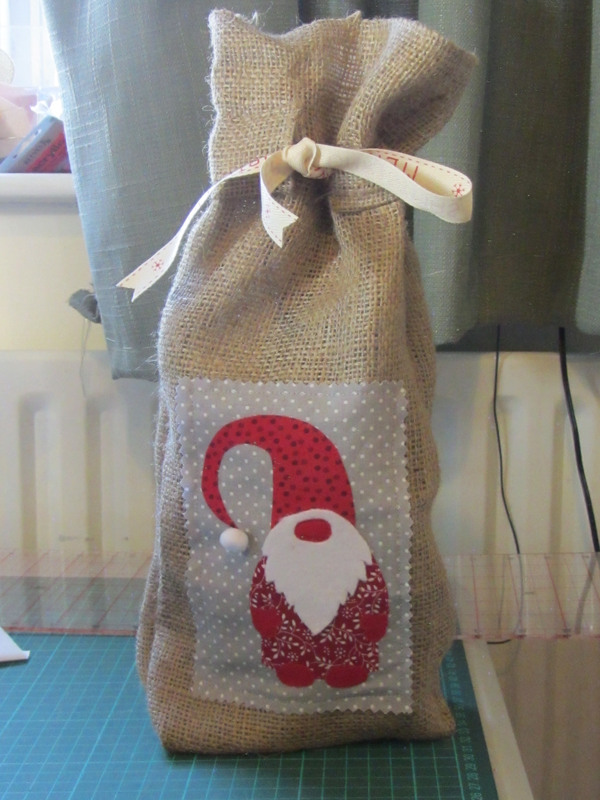 I have also started making some bottle bags with hessian, and using the little tomte applique. I will post a picture when they're finished. Other than that, I have several lists printed for shopping and things to do before Christmas so hope to be ticking them off soon. I hope you have an enjoyable and creative December. Our next Shropshire Art Society exhibition is fast approaching. This time it will be at the Bear Steps gallery in the centre of Shrewsbury. 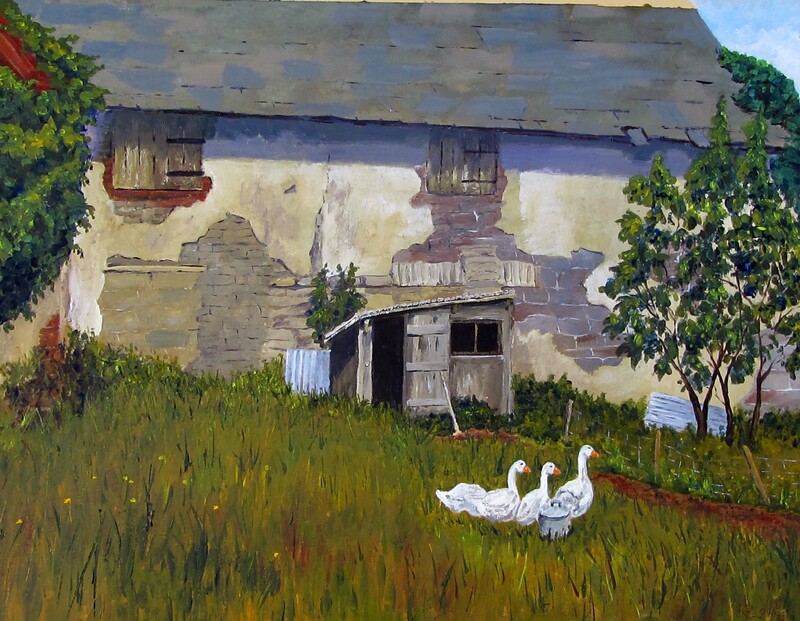 The above painting, the old barn at Brockton with geese, will be on display. It is based on a photo taken by Gordon Dickins, which features in his Shropshire Seasons book, and is with his kind permission. 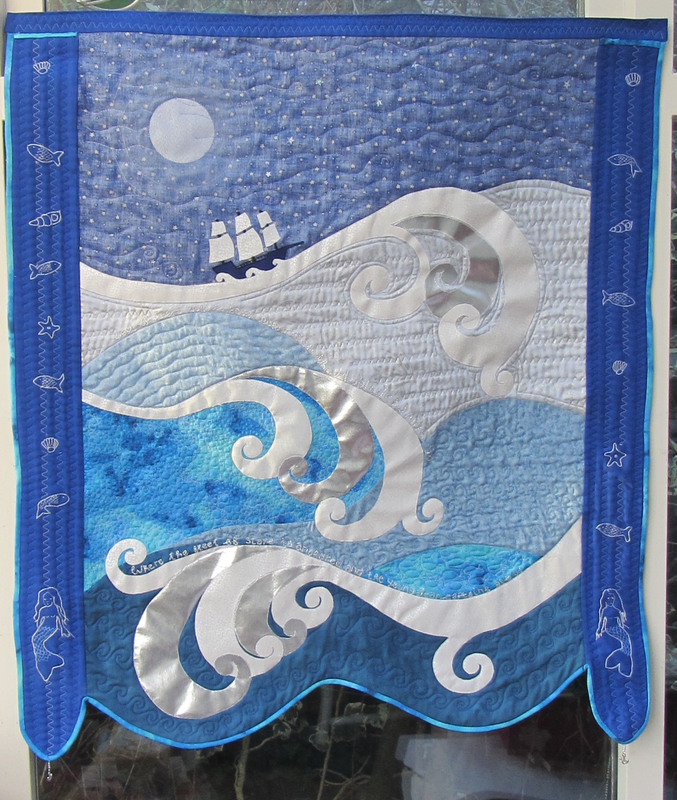 Meanwhile, the Open Art exhibition is still running at the Qube, Oswestry, until midday on 30 October, where my sea-going wallhanging is on view. I am delighted to have now started Module 8 of my City & Guilds course, and the little Tomte pictured here is the first of the applique samples for it. 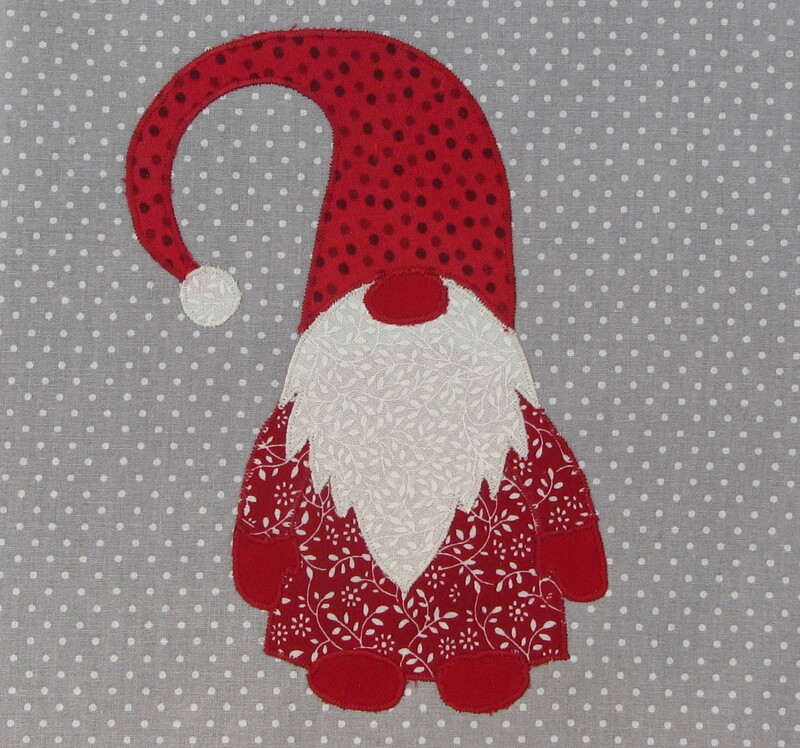 I will use him either as a mini wall hanging for Christmas or as a centre for a Christmas scrapbook. I will post the template for downloading shortly. Now all I have to do is make that Gingerbread House in fabric... I will post some pictures of my progress. The next sample will be two blocks for a Baltimore album quilt. I have designed them and made a start on cutting out the leaves but I think this is going to take me a while to complete. Hopefully it will be this side of Christmas as they are both Christmas themed designs. and as a PDF for cutting by hand. A great month for exhibitions. Our printmaking group visited the RBSA in Birmingham to see the wonderful exhibition of prints in their Print Prize 2018. This celebrates the best of contemporary print makers in the UK, and is well worth a visit. The exhibition closes on 1 September. Another great day was my visit to the Festival of Quilts at the NEC. I came away inspired by so many talented textile artists. And the shopping was good too. 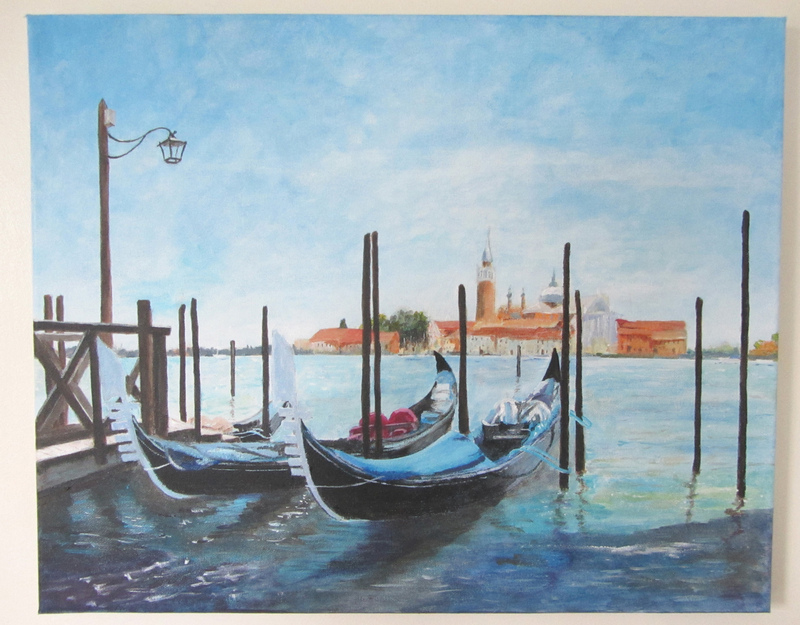 The Church Stretton Art Exhibition, which ran for two weeks to 11 August had some wonderful paintings and photographs by local artists, and I was very pleased to have sold my 'Venice' painting, above. I have just been notified that my wallhanging, pictured in February's post, has been accepted for the Qube Open art competition in Oswestry. It will be on display there from 6 September to 30 October, though after all the hours it took me to make, it is not for sale. In early June we returned to beautiful Lake Como for a week. I could never tire of those stunning views of lake and mountains, and the picturesque lakeside villages. I took lots of photos so hope to work on some paintings in the dark days of winter. 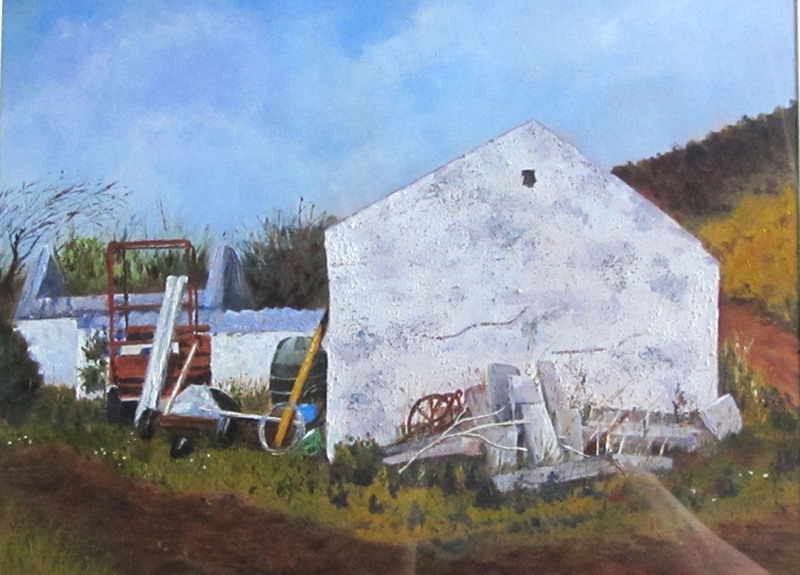 June saw the Shropshire Art Society summer exhibition, and I am delighted to have sold one of my paintings, of the ruined white stone cottage in Inishowen. I am now getting ready for the next exhibition in Church Stretton. 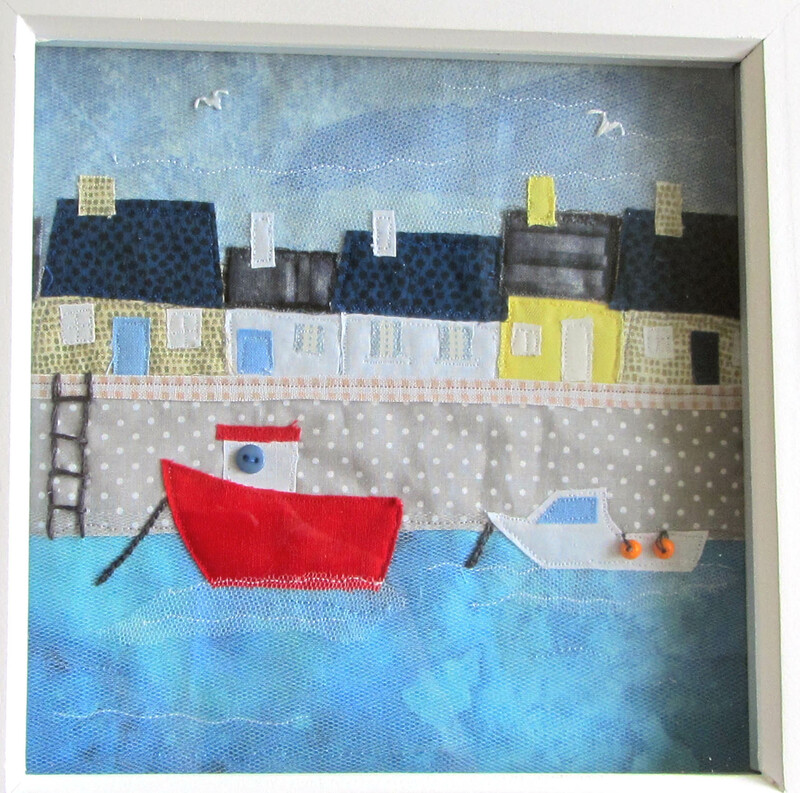 I have just completed a small textile stitched collage, above, of a harbour. 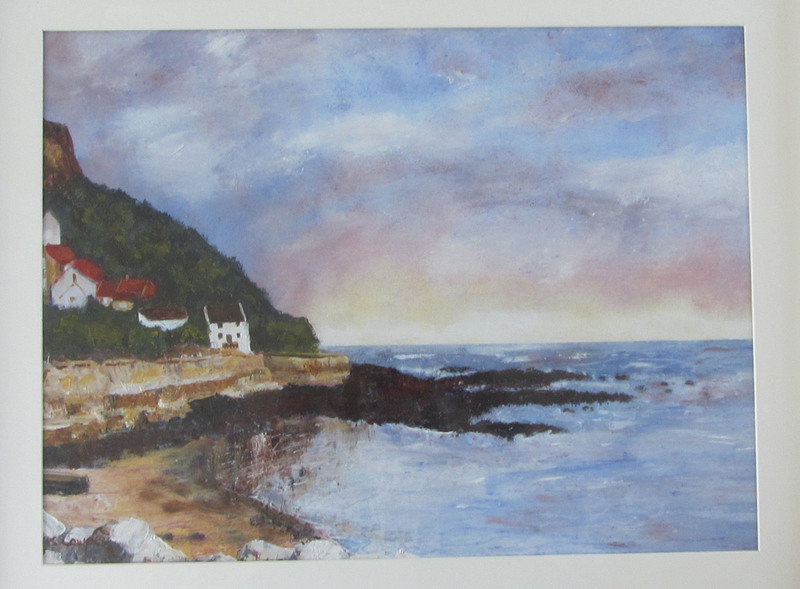 I also managed to finish working on my painting of Runswick Bay, and this will shortly be for sale, unframed, on my Beanpole Books website, as well as the earlier painting of Malcesine on Lake Garda, another favourite holiday destination of ours. 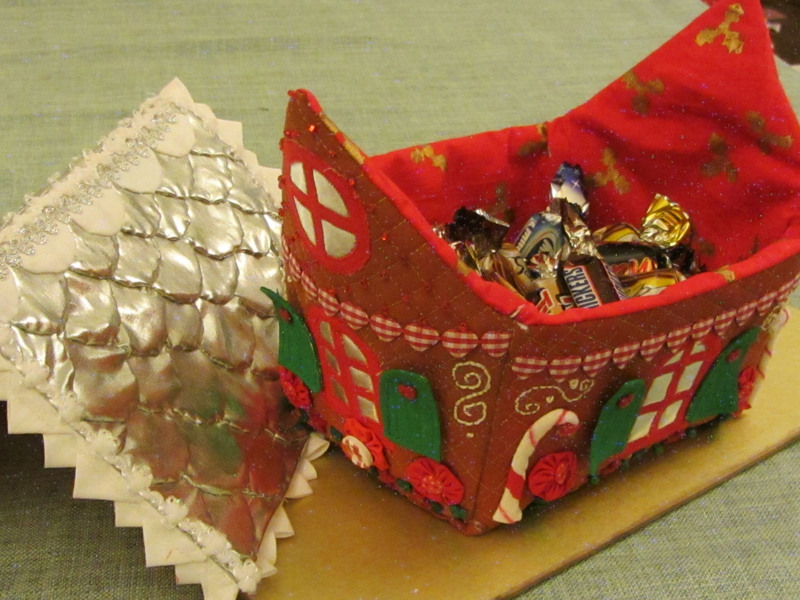 Thanks to the exhibition season, my work for the City & Guilds course has taken a back seat, but I am finalising my designs for a textile gingerbread house so will be sharing some photos shortly. 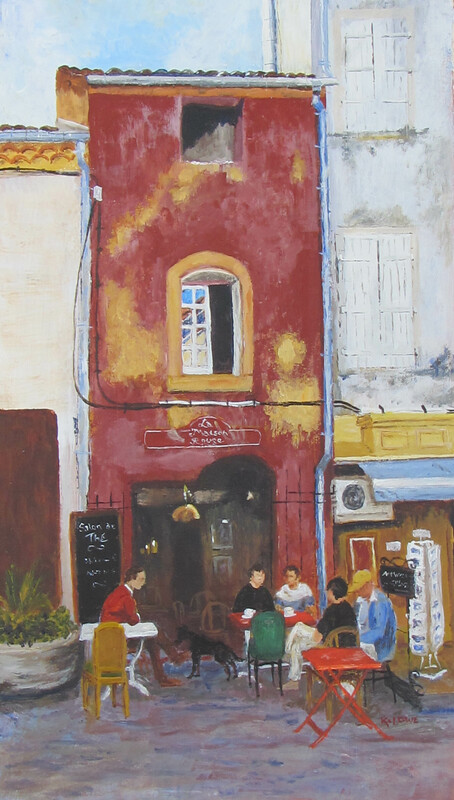 Our painting exhibition in Shrewsbury closed at the end of April, and I am pleased to say I sold the painting of the red cafe, based on the photo I took in Provence last year. Our next exhibition will be in June, again at St Marys church in Shrewsbury, as part of the Shropshire Art Society Summer Exhibition. I am still working on the Runswick Bay painting I thought I had finished last year, but I felt it needed more texture. Having finally got to grips with colouring and dyeing fabrics for my City & Guilds course, I am about ready to start on the next batch of sewing samples. As this includes hexagons and cathedral windows, I think it may take a little while to complete. A belated Happy New Year. I had a busy January, finishing the wall hanging, above, for my City & Guilds course. Lots of practice still needed on the free machine quilting, but I had fun doing it. The next module will tackle putting colour into fabrics so there will be some dyeing to play with, which I have never done before. Should be interesting. I am taking a short break from the sewing to concentrate on finishing some paintings as our exhibition is coming up at the end of March. This will be in St Marys church in the centre of Shrewsbury and runs for a month from 31 March to 28 April. As before I will be sharing the space with my husband's paintings, so there will definitely be a bit of jostling for elbow room. 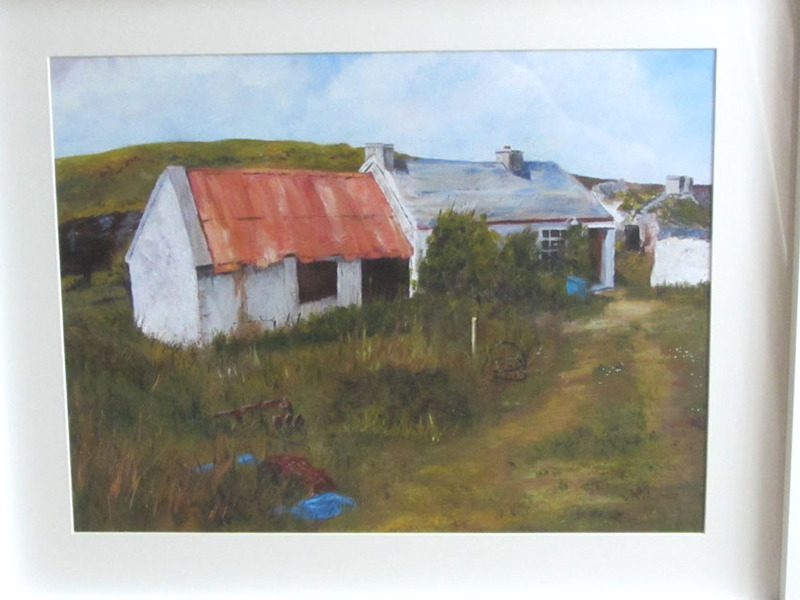 Below are two of the paintings I have ready, which feature some beautiful old abandoned farm buildings we came across up in Inishowen last summer. Such beautiful countryside. It was really inspirational. 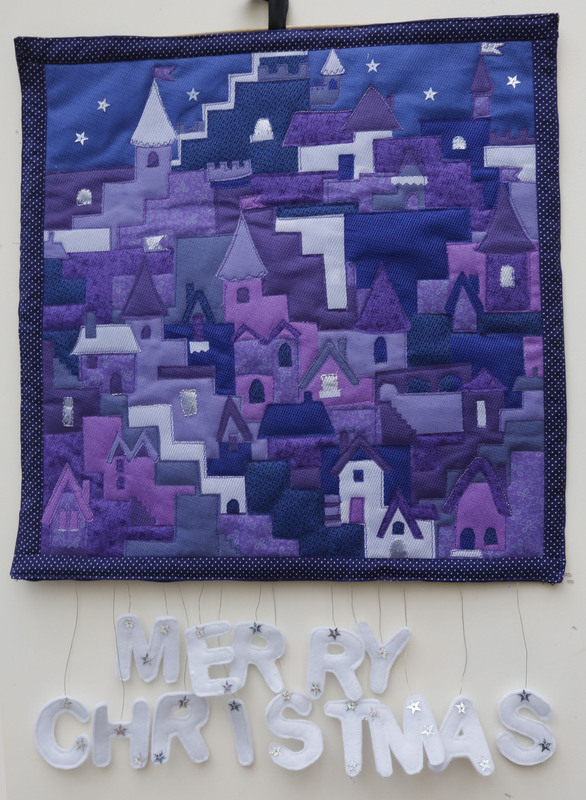 I am enjoying my City & Guilds Patchwork and Quilting course and am now getting to grips with making the wall hanging I designed for Module 6. Yes, half way through already. Only another year or so to go. But I am taking a break to get on with my Christmas cards. Above are the two designs I have made so far using the Silhouette Cameo to cut them out. 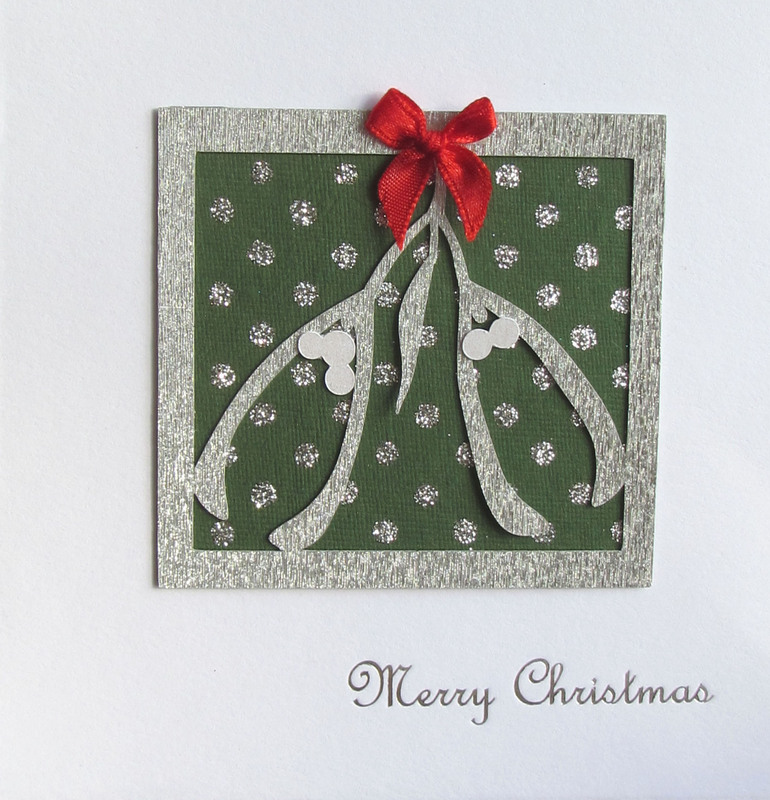 The first, the Mistletoe card, is a cut out frame in silver card mounted onto a sparkly patterned mulberry paper. The image is from the first novel in the Quilt Detective series. 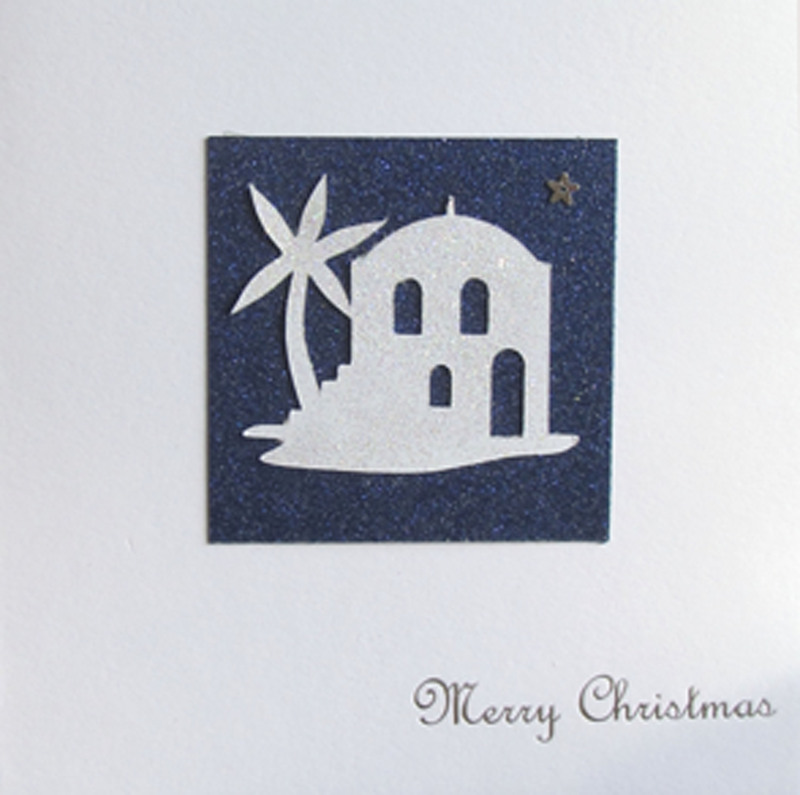 The second picture, which I have called my Bethlehem card, is cut in white which I then glittered and mounted onto glittery dark blue card, and added a small sequin star. Now to get on with the fabric cards for the family. At the moment our garden looks like a Christmas card, with deep snow and bright sunshine. And there is more snow forecast. At least the weather will give me chance to get on with my sewing rather than venturing out. I haven't even made a snowman yet. 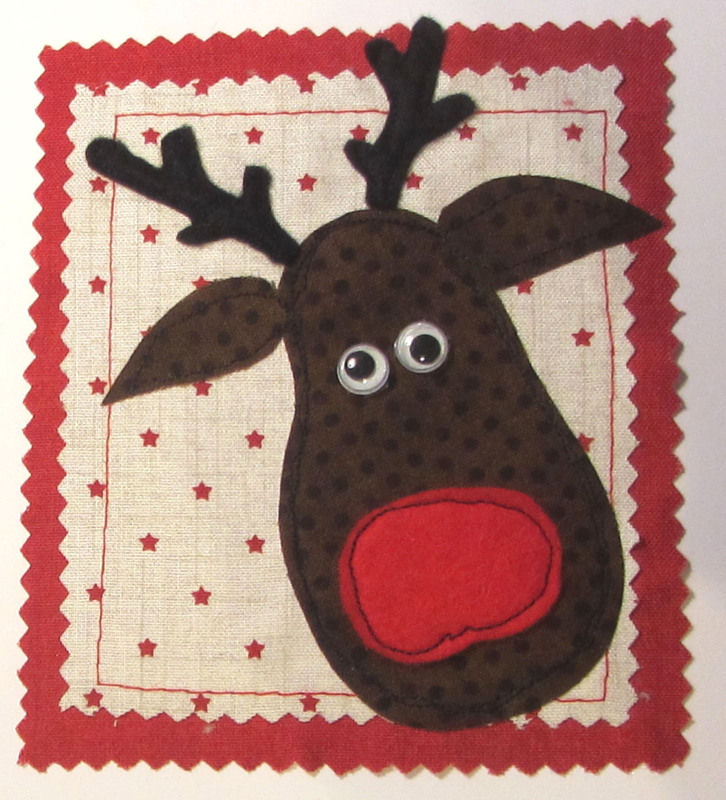 I will post some pictures of the fabric cards as soon as they are finished. The designs for the two cards above are ready to download on the right. 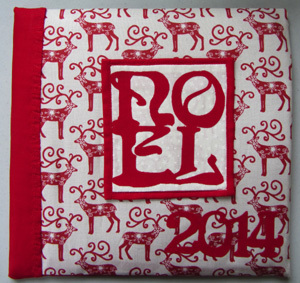 Thanks to the heavy snowfall, I have had chance to finish my fabric cards, pictured below. 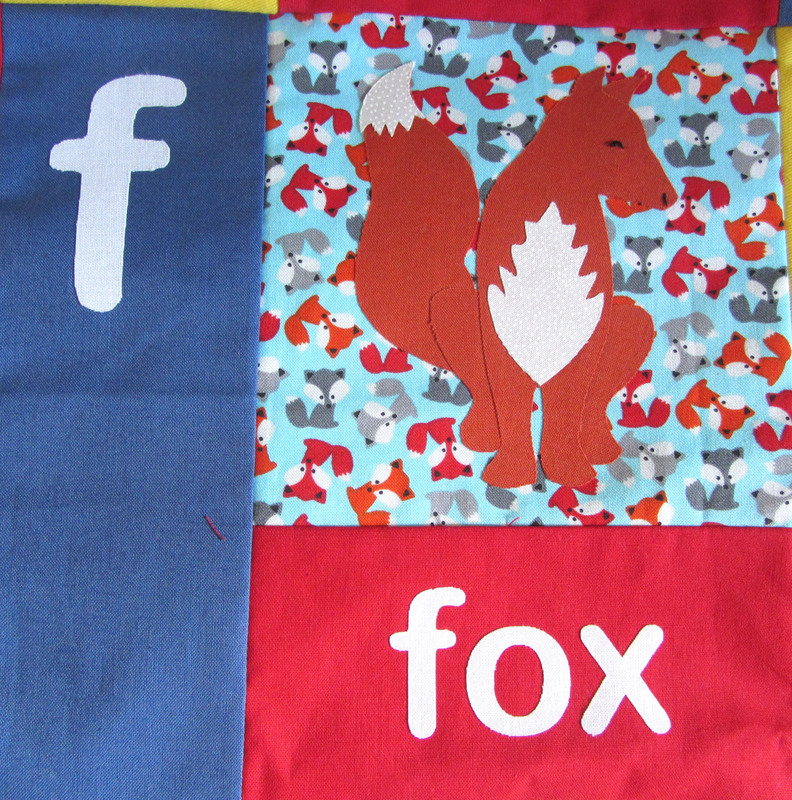 I used Bondaweb to cut out and stick the shapes onto the background fabric, then free machine stitched around them. I definitely need more practice in free machine stitching. The Church Stretton Arts Festival opens on Tuesday 1 August at Church Stretton School, and I have two paintings in the exhibition. Above is a view of Runswick Bay, from our recent trip up to Whitby, and the second is a painting of Malcesine on Lake Garda, one of our favourite holiday destinations. The exhibition closes on Saturday 12 August, and is open from 11am to 6pm daily. As well as paintings and photography there will be lots of crafts on show so it is well worth a visit. With the paintings finished I can now get back to my course module, and develop some of the designs into 3D which will be a new experience for me. Not long now till the Quilt Festival at the NEC, so I am looking for inspiration! The Shropshire Art Society Summer Exhibition is over for another year, but we are now looking forward to exhibiting at the Church Stretton Arts Festival in early August. I am hoping to have two paintings finished by then. In the meantime I have completed Module 4, Texture, of my City & Guilds course, and above is the example of Stained Glass patchwork I designed. It's based on a photo I took of the countryside looking out from Lyth Hill, near Shrewsbury. I am now working on Module 5 which so far is great fun. I am hoping to incorporate some 3D books and pop-up cards with it, as well as trying my hand at Trapunto and Italian Corded quilting. Our quilt group was fortunate to have Sylvia Crichter come to talk to us with her wonderful corded and trapunto work just a few weeks ago, so I am already inspired. The Shropshire Art Society Summer Exhibition is looming fast. 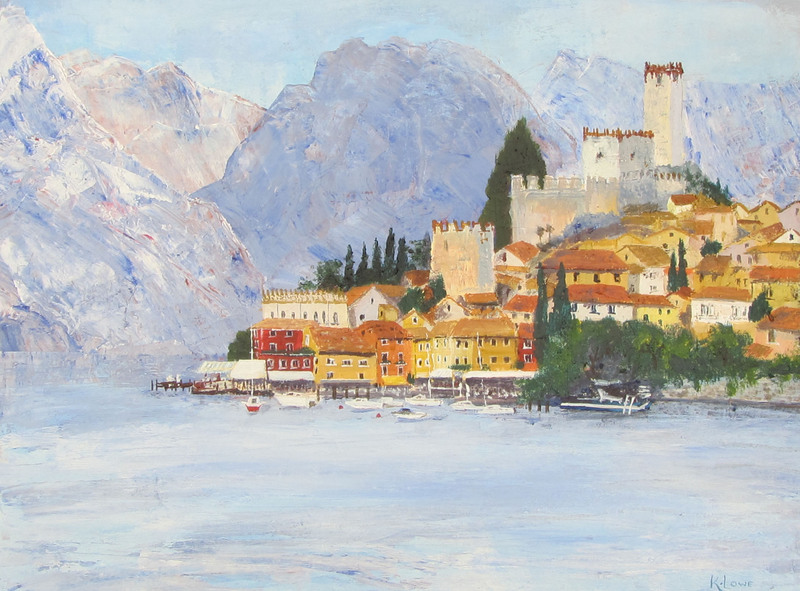 I have at last finished my painting for the exhibition, above, which is a view approaching Malcesine, on Lake Garda. Happy memories! The Exhibition opens on Tuesday 20 June and runs till Thursday 13 July, 10am to 4pm every day except Sunday, in St Marys Church in Shrewsbury town centre. It should be a good mix of styles and subjects, and I am looking forward to seeing what everyone has been up. We had a wonderful week in early May in Northern Ireland, for my son's wedding at the beautiful Beech Hill Hotel, Derry. We had a great time exploring the stunning north coast and the Inishowen Peninsula, Co. Donegal, all in glorious sunshine except for Malin Head which was shrouded in sea mist! The views from the stone ringfort of Greenan Fort are spectacular. Looking forward to going back next year to explore more. 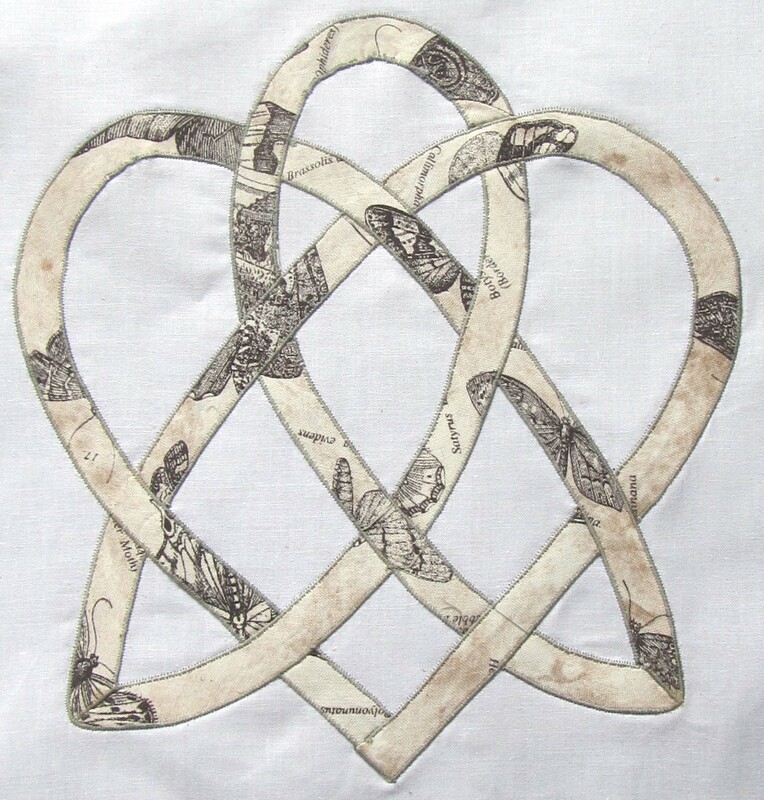 Since we got back I have been ploughing on with module 4, texture, of my City & Guilds course, and the above photo is the bias binding appliqué which I finally mastered, making a Celtic heart. Just have to focus on finishing my entry for the Shropshire Art Society Summer Exhibition now. At least the new book , the third in the Quilt Detective series, is at last taking shape, having had several rewrites and revisions. My literary efforts take even longer than my quilts! Thanks to the Shropshire Art Society, I have some more paintings in an exhibition at St Marys Church in the centre of Shrewsbury. As well as the Seedheads painting I finished last year, I have two new pictures using collage and acrylic paint, and a textural style. 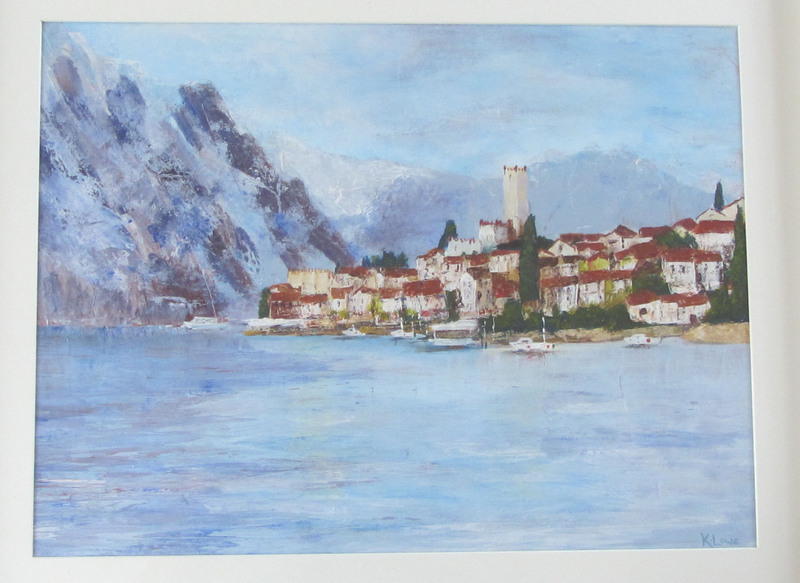 The first is a view of Villa del Balbianello on Lake Como, based on a photo my husband took a few years ago. The second, above, is a view of the little bay at St Brides in Pembrokeshire, another favourite holiday spot of ours. I am enjoying this more textured style of painting, and trying to introduce some fabric elements, at the moment by printing through lace and net. The exhibition runs till 1st April. I must start work on Module three of my City & Guilds course, which this time focuses on Colour, which should be interesting. I will post some pictures once I get started on the designs. A busy January. 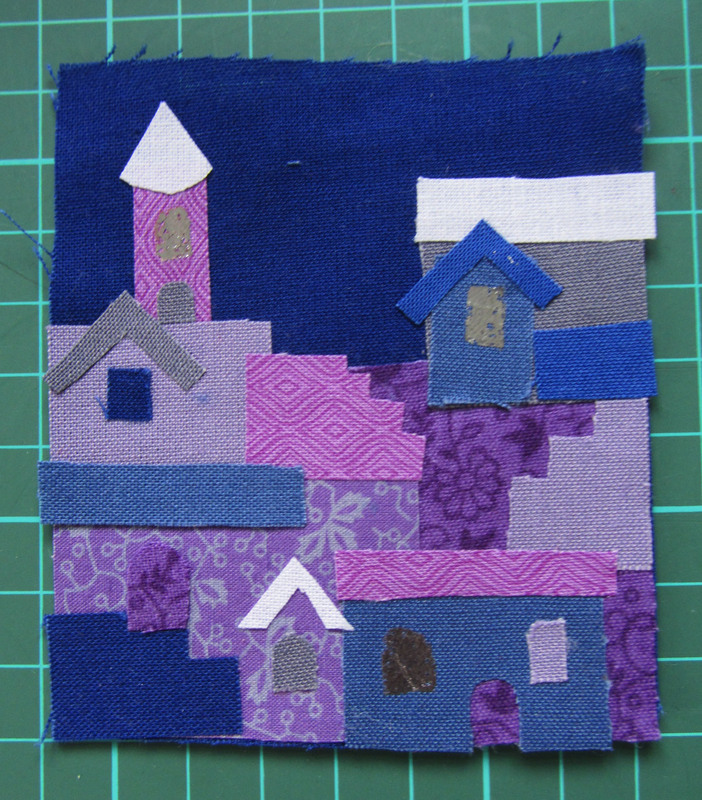 I managed to finish the second Module of my City & Guilds course on Patchwork and Quilting. This module was based on industrial themed shapes. 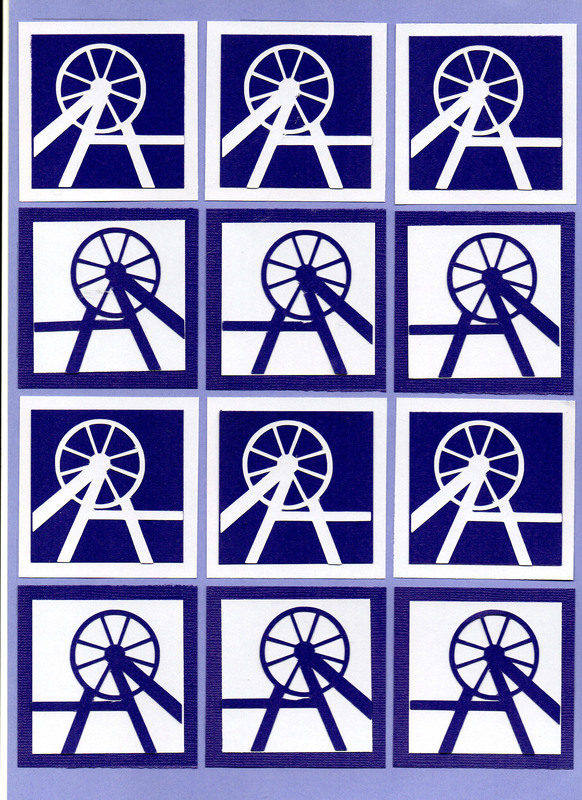 I designed the Pit head pattern, above, from my sketches of the winding gear at Blists Hill Victorian Town, Ironbridge. I think it would make a good applique cushion or mini quilt. I also have two of my paintings on view in the Coffee shop gallery at the Gateway arts centre in Shrewsbury. The exhibition of students work runs till the end of February. My next goal is to finish the first draft of the third 'Quilt Detective' story, which has been delayed due to the Patchwork course. I really need to get some of my New Year's resolutions achieved before the weather picks up and we are out and about again. Thankfully I finished my first module for the City & Guilds Patchwork and Quilting course, and it passed its assessment. On to Module 2, which has an industrial theme and focuses on Shape. I already have a few ideas as we are based not far from Ironbridge, the birthplace of the Industrial Revolution. 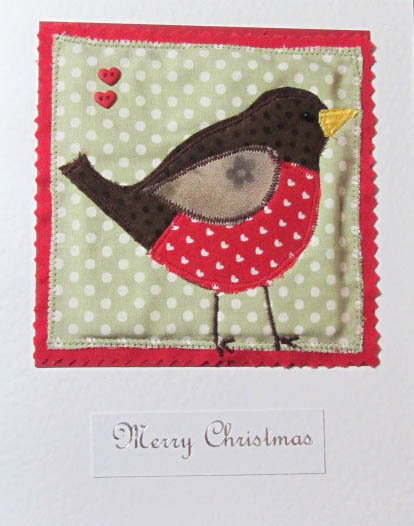 I also managed to finish making my quilted and applique Christmas cards for the family, this year featuring this robin. I have given Santa a list of craft items I could really do with, so hope he is able to find them. Wishing you a peaceful Christmas and a craft-rich New Year. Summer is now very much a distant memory but we did spend a beautiful week visiting Avignon and Arles by Eurostar, and enjoying their art galleries. On our return, I decided to take the plunge and sign up for the Level 3 City & Guilds course in Patchwork and Quilting. The twelve modules should take up to three years to complete, but it's very much at my own pace as the course is online with the School of Stitched Textiles. So far I have been working through the design element of Module 1, Line, and have found it great fun. It has given me a new way of approaching design for abstract quilts. The picture above shows one of the collages that emerged from the exercises. 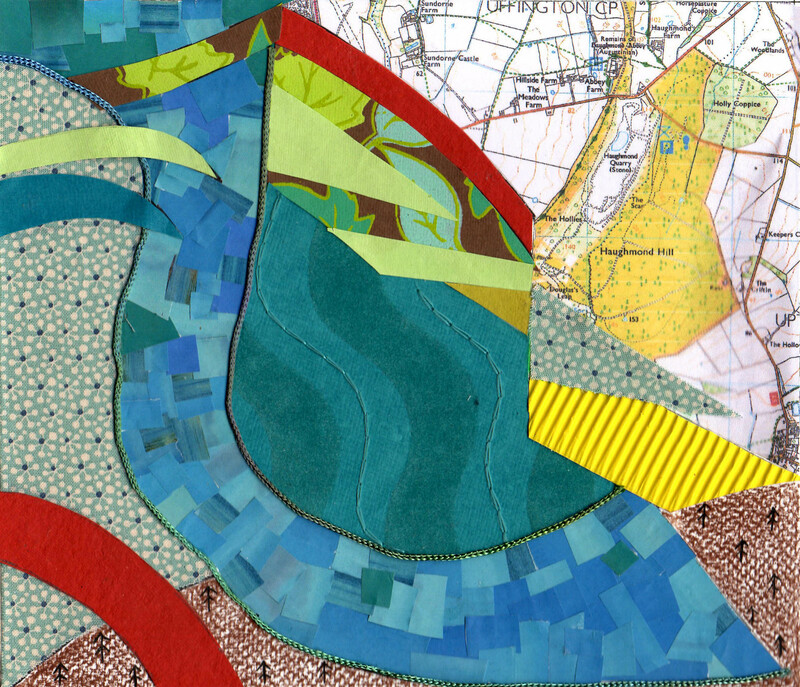 I decided the main shape looked like a river so have taken that as a starting point for a map themed collage. 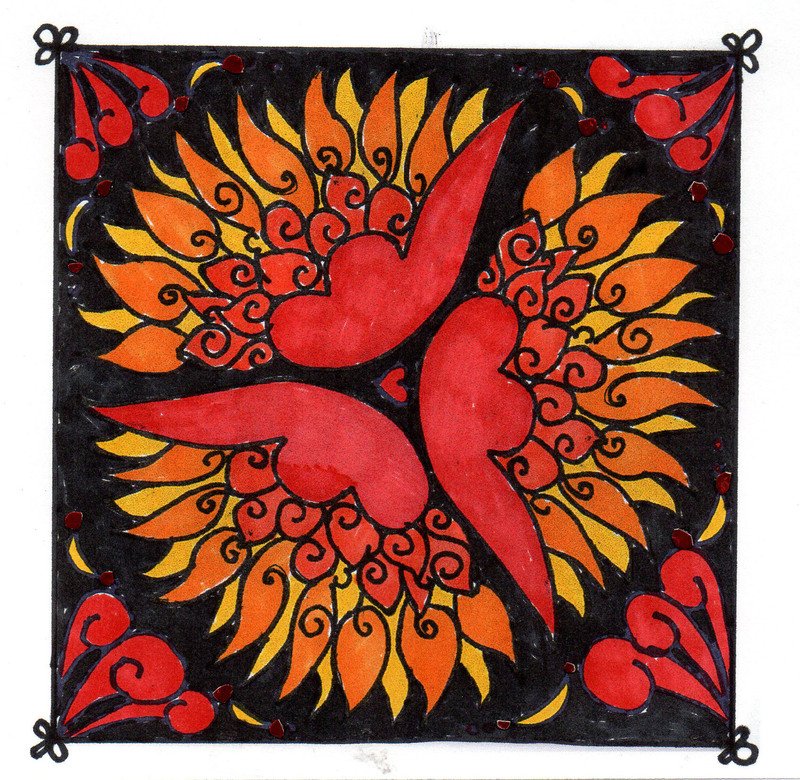 I have also been able to use some Zentangle doodling in the designs, which I love doing. I still have not had time to translate these into cushion covers. 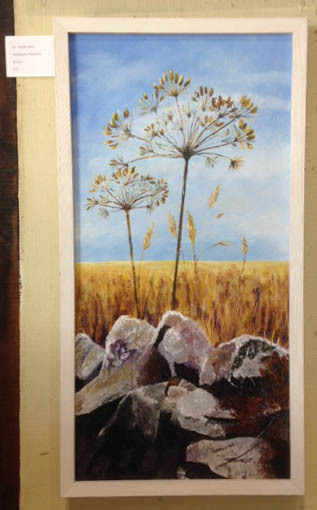 I also managed to finish the painting, left, for the Shropshire Art Society Autumn Exhibition, based on the seedheads on a Pembroke coast path. 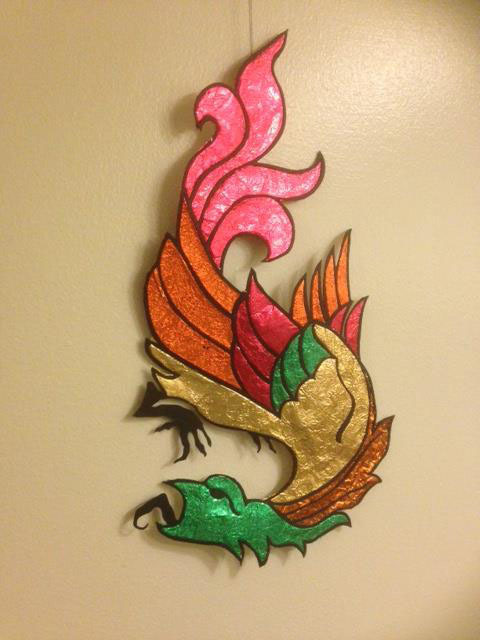 I didn't have time to embellish it with sewing or beads, which was the original intention. Still, I am pleased with the result. Another course I started this Autumn is on printing, again through Shropshire Art, as I was keen to have a go at linocuts. I have long been a fan of the woodblock prints used to decorate book pages, and I am hoping to try printing simple designs onto textiles. It has given me some ideas for Christmas cards this year, so here's hoping I manage to come up with a good, and simple, design. We've had a busy few months since Easter, and the garden is looking at its best at the moment. All the rain has certainly helped settle in our new gunnera into what was the pond. We also enjoyed a short holiday in Carcassonne, France. We travelled by train with Great Rail Holidays, and luckily came back on time despite the French strikes. We took loads of photos which I hope to use as a basis for future paintings and quilts. 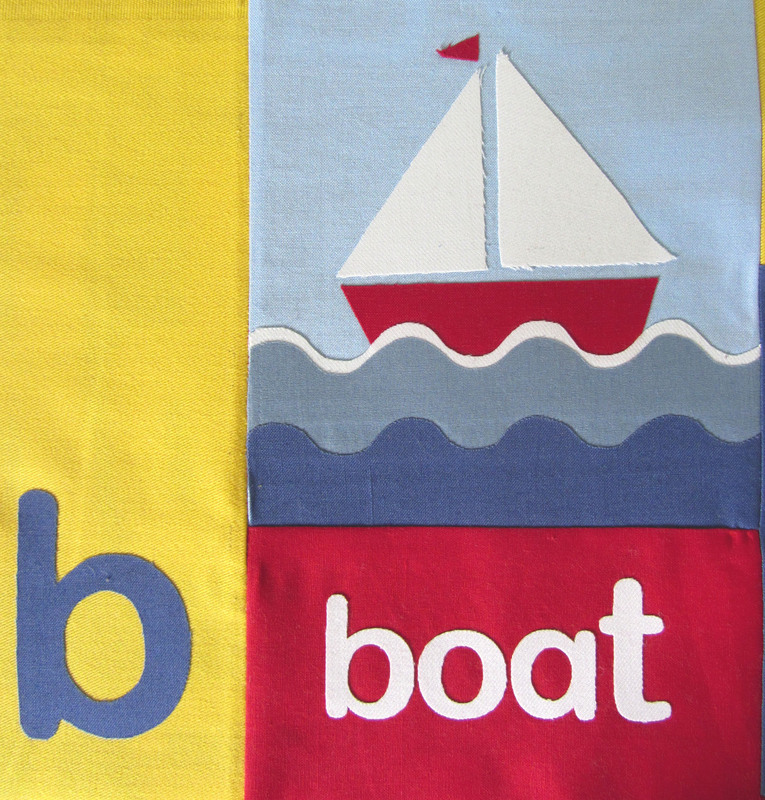 I am also very pleased to have at last finished the applique for the ABC quilt. I still have a long way to go, as I now need to stitch round all the letters and images on the quilt top, and then quilt the whole thing, but so far I am pleased with it, and hope to have it finished by the Autumn when our little grandson should be ready to transfer from his cot to a little bed. 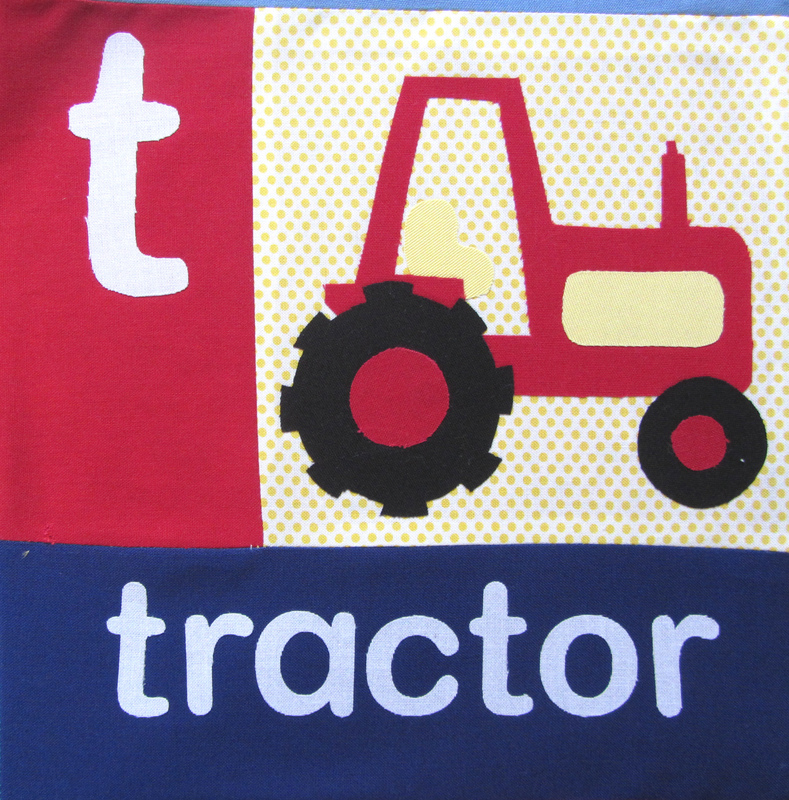 The little red tractor is sure to be a favourite with him. To see my progress so far and download the templates, go to the ABC Quilt page. The Shropshire Art Society Summer Exhibition is now underway in St Mary's Church, Shrewsbury, and I finally managed to finish my painting of Venice, based on a photo my husband took when we were there two years ago. It is in acrylics and painted on a box frame. This is my first exhibition so I would be interested in any feedback. With that painting finished, I now need to focus on a painting for the Autumn exhibition. It would be great to combine some textile paint and stitching. I have just finished making a batch of Easter cards for the family. I decided to use the little sheep template I designed last March for the carrycot quilt. I printed the sheep template and traced it onto Bondaweb, then ironed the pieces onto white and black fabric. 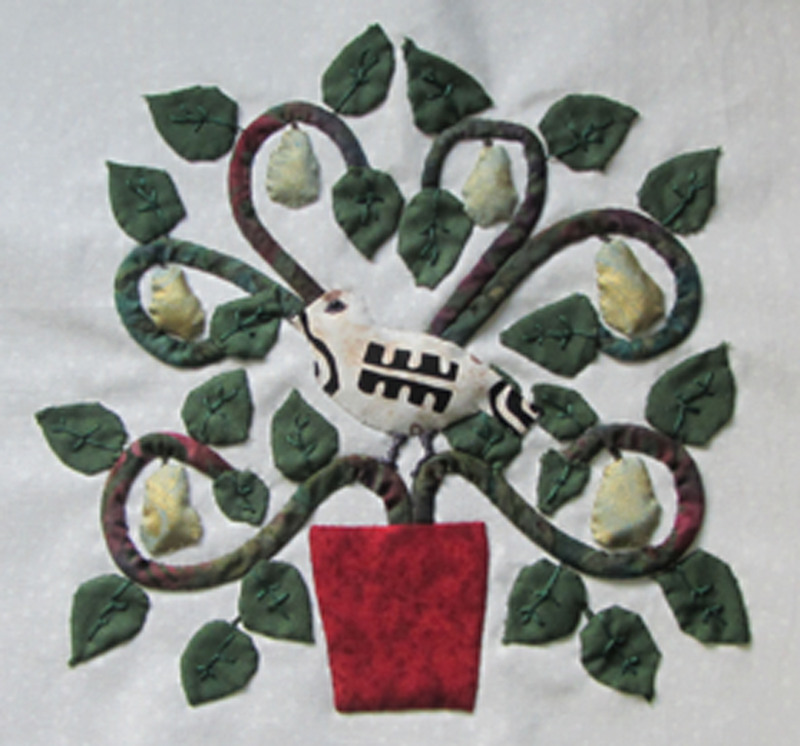 The sheep is assembled by Bondaweb then stitching onto an 8cm square of fabric which I have trimmed with pinking shears. The ears are simply fixed with Bondaweb. I used satin stitch for the legs and feet, and a single Y stitch for the nose and mouth. To complete the sheep, I stuck on two wobbly eyes with fabric glue, though you could use little black beads. I then pinned a smaller square of quilt wadding to the back of the fabric square and cut another larger square of fabric approx 10.5 cm, and stitched the smaller square to it to make a mini quilt. I stitched round the outline of the sheep's body to give it a little more dimension. I then used double sided tape to fix the little quilt to the card then stitched round the edge of the larger square of fabric. I used A4 hammer white card folded in half, so there is plenty of room for the greeting as well. 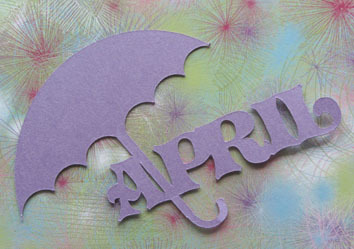 The card has a Happy Easter greeting cut on the Silhouette Cameo using the Ballpark font. 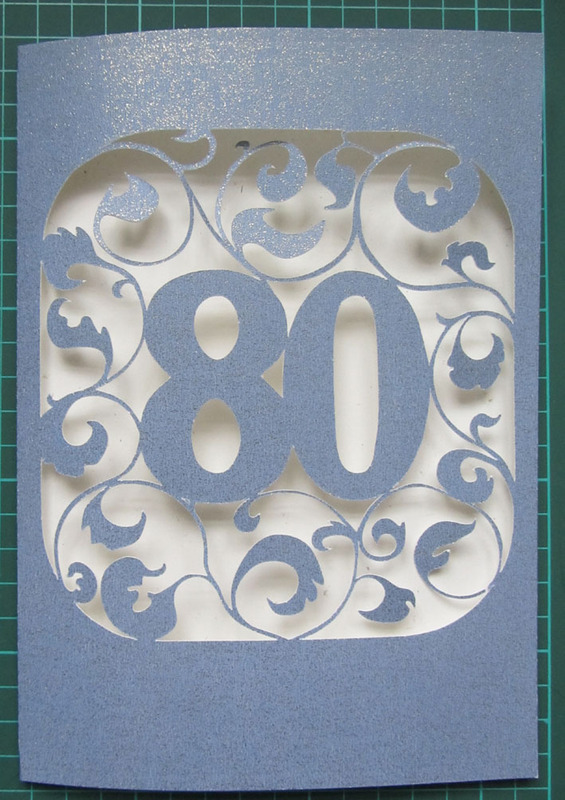 Inside the card, I simply glued a square of pale patterned paper to cover the square of stitching. 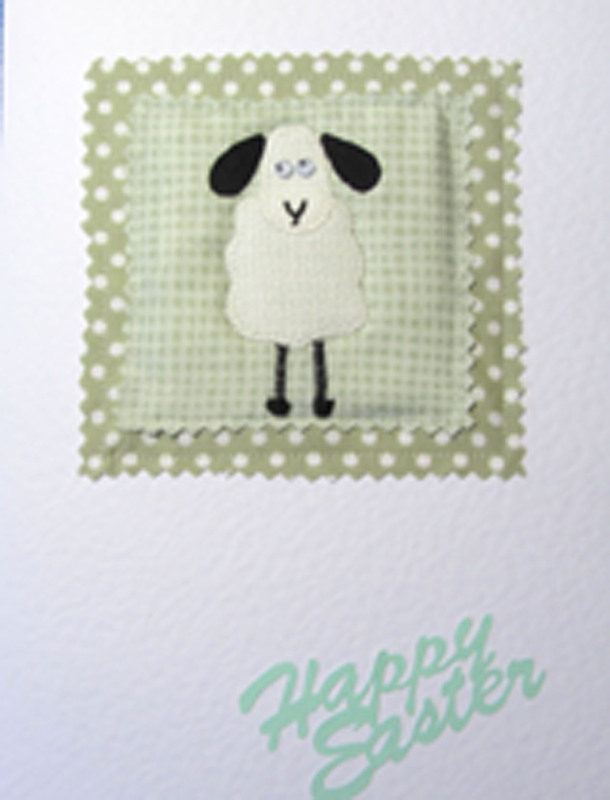 To make your own Easter sheep card, download the template in PDF or for electronic cutters from the Quilt page. I have now completed the next batch of blocks for the ABC quilt, running from Elephant up to Owl. I have not as yet quilted them, but they are pieced together and I have just embroidered a few eyes and noses where required. Next on the list is the panda, which is nearly finished, followed by Q, and in the end I have decided on Quack and am using a duck template. The templates are ready to download from the ABC quilt page here. Last month I attended a great workshop by Angela Morris, where we made these gorgeous Village wallhangings. The final quilt measures 15 inch square plus a half inch border. It is made up of bondaweb backed fabrics cut into squares, oblongs and step shapes, layered onto a square of backing fabric then ironed. The next stage was to add smaller squares and oblongs for windows and doors, then some triangular roof shapes. I also added some bondaweb squares and ironed on silver hot foils for some of the windows. Once everything was ironed securely, we topped it with a layer of tulle and tacked it to a thin layer of wadding and a backing fabric, then stitched around all the shapes. The quilt was finished off with a border and hanging loops. I decided mine was going to be a Christmas wallhanging, so added some white felt letters hung on silver wire. 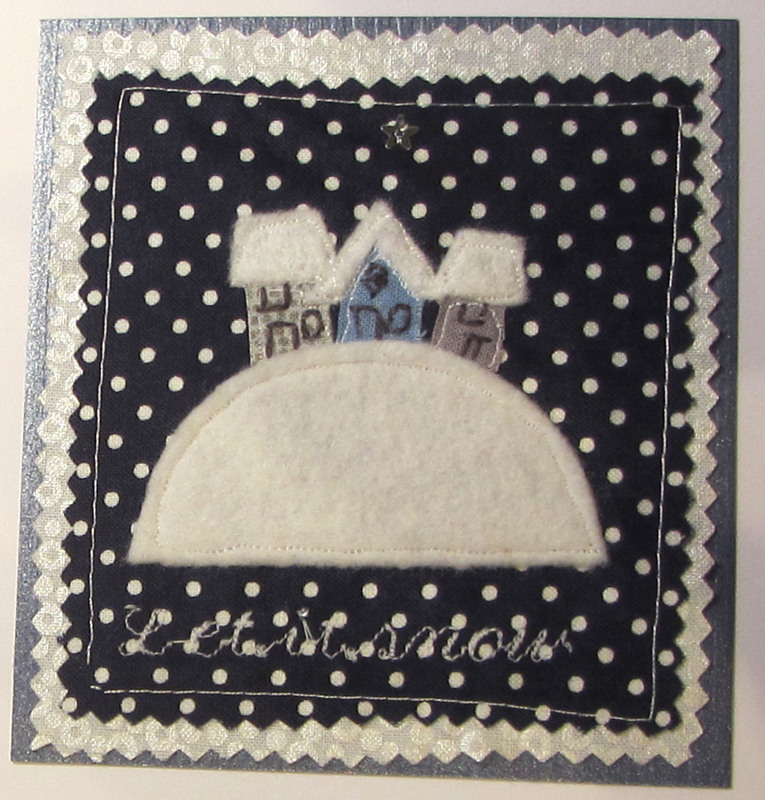 I had quite a few scraps of fabric left over, so used them to make Christmas cards. This time I simply ironed the little pieces of bondawebbed fabric onto a rectangle of backing fabric 3 in x 3.5 in, then topped it with tulle. 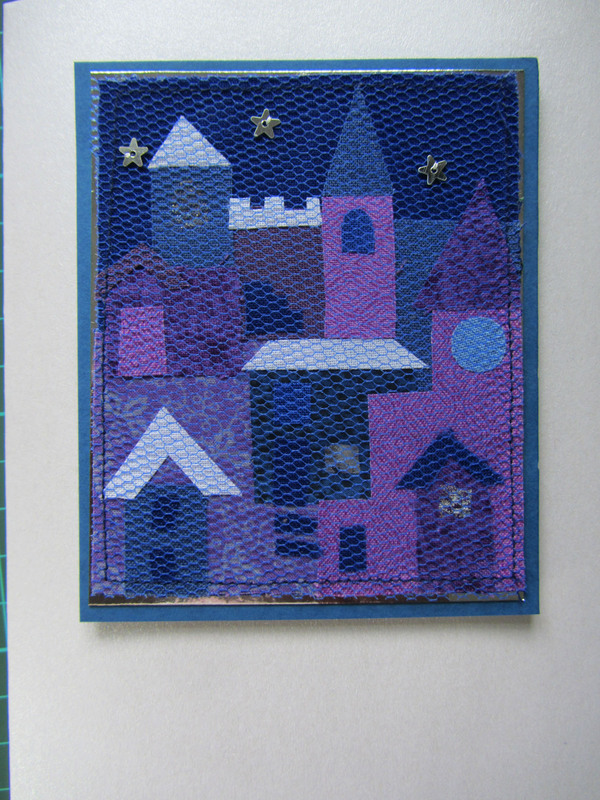 I stitched round the edges of the rectangle and added star sequins. The fabric picture was then glued onto silver card, using fabric glue, and that was mounted onto a larger rectangle of dark blue card. 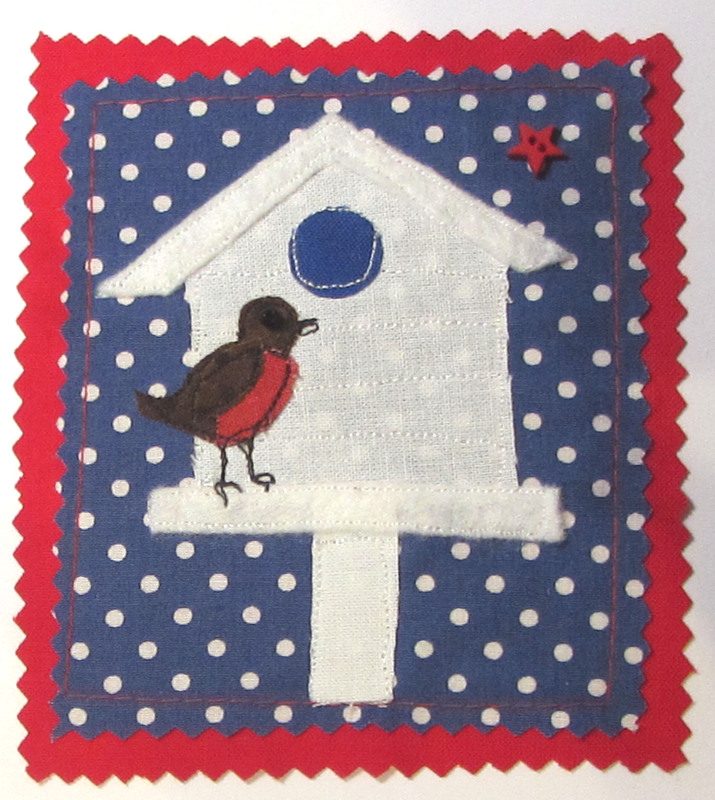 I think the cards look really cute, and it is a great way of using up scraps of fabric. And no two pictures are the same ! The picture on the left shows the little shapes ironed onto the backing, before adding the tulle and stars. The picture on the right is one of the completed cards. It's been a busy summer here. We celebrated our daughter's wedding in late June, and had a fabulous day. After all those weeks of preparation, making the invitations, the Order of Service, painting and glittering flowerpots and table numbers, and not least, making all the sugarcraft roses for the wedding cake and 150 cupcakes, it was good to get away for a quiet few days in Pembroke. The sun even shone a few times. I'm making an Alphabet quilt for my grandson, ready for when he moves from a cot to a bed. 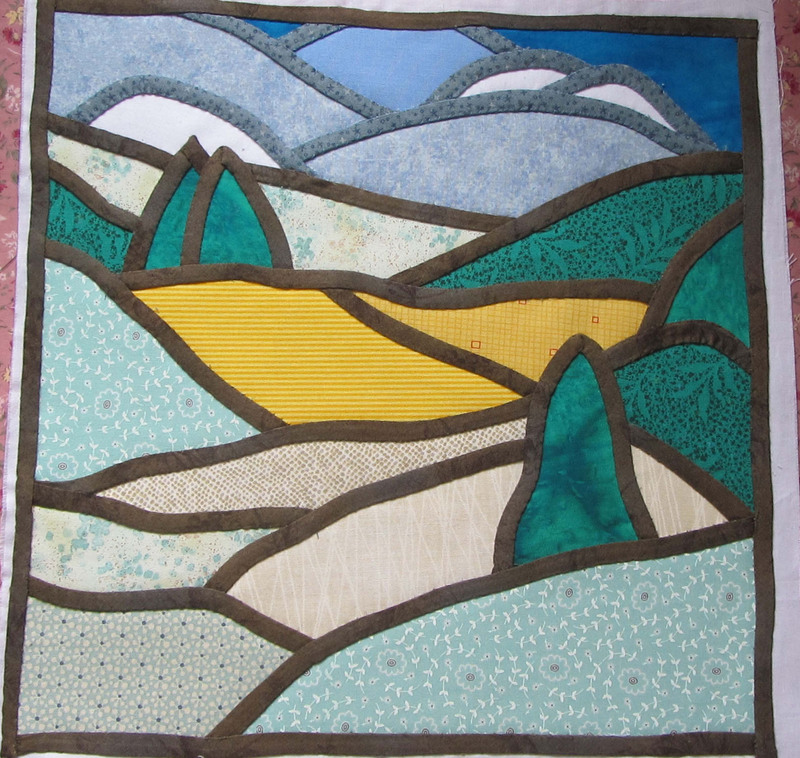 The quilt is made up of 28 nine inch blocks and a six inch border all round. Each block has a six inch square with the main picture, and two 3 inch wide strips with the initial letter and the word it refers to. 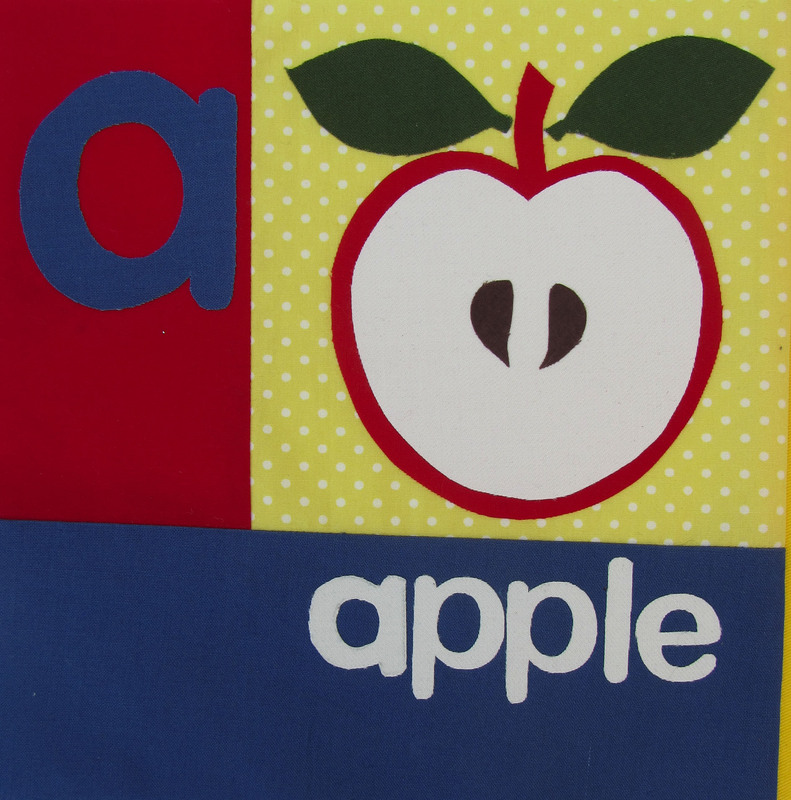 The templates for the first four squares, Apple, Boat, Cow and Dog, are ready to download here on the ABC quilt page. I will upload another batch of templates in October. 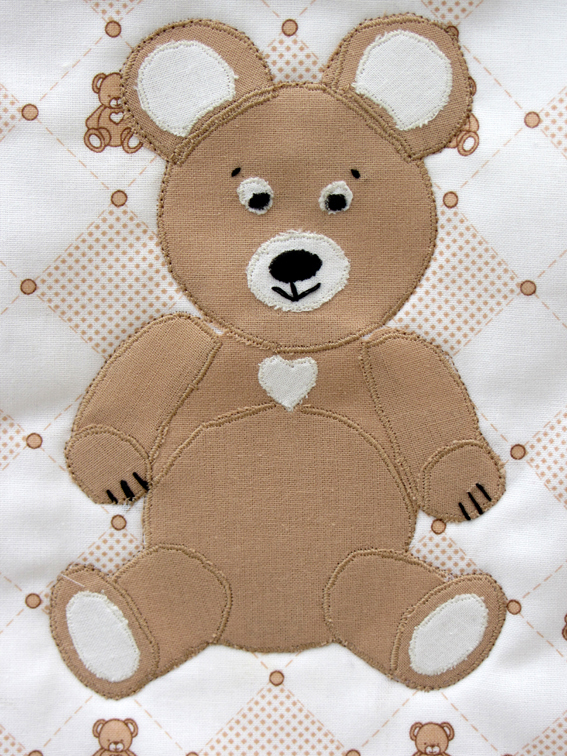 So far I have simply ironed on the applique shapes using bondaweb. I will stitch the shapes once the quilt top is assembled and the quilt layers tacked together.